Cables and adapters outfitted with USB-C have been becoming increasingly popular as smartphones and computers alike have adopted the standard, including Apple with its 12-inch Retina MacBook that launched in the spring of 2015. Accessories such as USB drives that make file transfers easier and larger docks have proven for users dealing with Apple's decision to include just two ports on the MacBook: USB-C and a headphone jack. NewerTech's NuPower 60W USB-C Power Adapter is less flashy than some of the new feature-intensive products, but that's largely a positive. 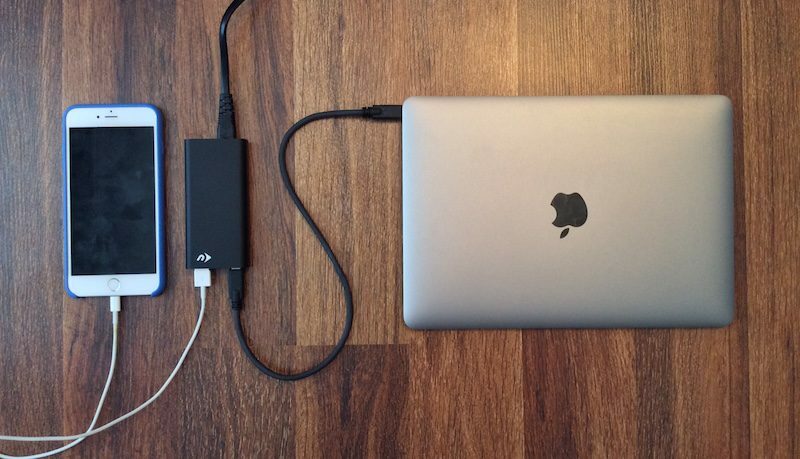 The Power Adapter replaces Apple's bundled 29W USB-C adapter to charge the MacBook, with the added bonus of a 12W USB-A port to simultaneously charge any traditional USB-powered device -- like an iPhone or iPad -- from the same adapter. As a replacement to Apple's power adapter, NewerTech's accessory has a slight edge in providing simultaneous charge to a second device, making it a potentially compelling alternative for Retina MacBook owners. The added visual clutter of thicker cables, however, might not be worth the $59.99 price for some people. The NuPower adapter comes in three pieces: a main body containing the USB-C, USB-A, and power ports, as well as a power cable and a USB-C cable. The main device is 4.2 inches long, 2 inches wide, and about 0.8 inches thick, so it's not that much of a cumbersome addition to a charging regimen, although obviously more so than Apple's bundled-in cable. The material on the body of the power adapter has a soft-to-the-touch matte finish that shouldn't hold fingerprint smudges, and has a nice weight to it (4.8 ounces, according to NewerTech). Although I didn't put it under too much of a strenuous test, it feels like it could survive the bumps and bruises of a backpack, bag, or anywhere charging cords usually end up thrown without thought. An understated NewerTech logo resides on the top of the adapter and is the only marking on the top of the device, while on the front the company has made it easy to find the USB Type-A and USB Type-C ports with accompanying text. The bottom of the adapter is a bit of a text dump, with all of the cautions, warnings, and specifications written in bright white text, buffeted in between soft silicone bumpers that help everything stay in place when on a solid surface. On the cable side of things, NuPower's power cable is about 8 inches short of Apple's 6.5 foot USB-C charge cable, providing plenty of clearance room for plugging up your MacBook. More length is added thanks to the 18.5 inch USB-C cable, not to mention the 4.2 inch adapter itself, adding up to a charging solution that's nearly 8 feet long. The power cable is one of the more frustrating parts of the NuPower adapter, with its thick, corded material that never really lost the bundled-up curves from the initial packaging it was in. Visually and functionally, it's just a noticeably non-Apple design, and that could bother people who are willing to spend the money on the Retina MacBook in the first place. The 18.5 inch USB-C cable is a better in this regard, but it is much thicker than Apple's white USB-C cable. NewerTech's claim that its adapter can charge "your USB devices up to 2X faster than comparable chargers," is evident only in computers that can accept the NuPower adapter's high-powered charging speeds (with voltage up to 20V at 3A). 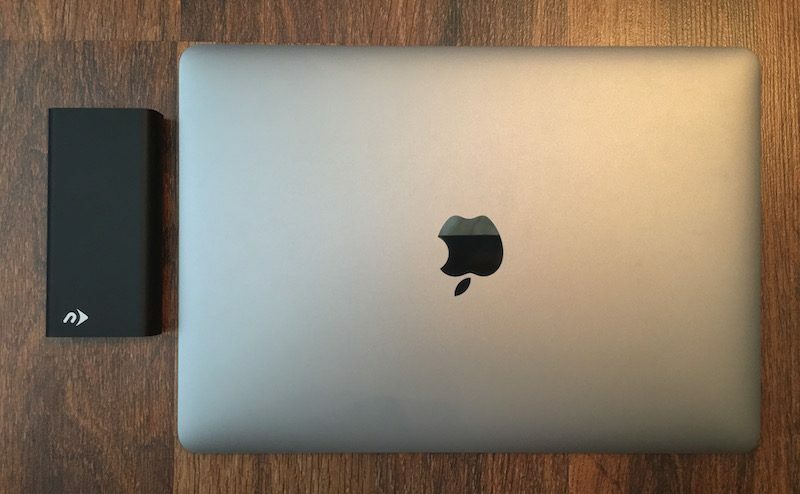 The Retina MacBook isn't one of those devices, so speedier charging shouldn't be a purchasing factor for anyone looking at advantages of NewerTech's adapter. 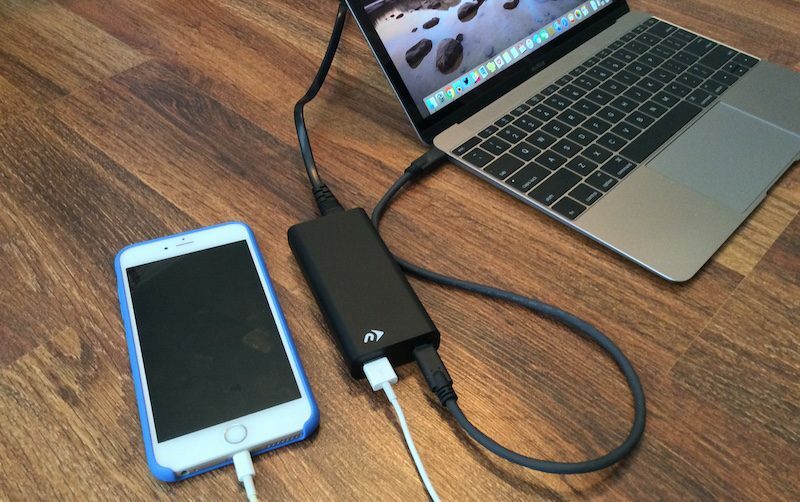 During my tests, the NuPower adapter fueled my MacBook up from 29 percent to 99 percent in 88 minutes, and my iPhone from 20 percent to 97 percent in just over 100 minutes. On the MacBook side of things, this makes the NuPower adapter essentially in line with the charge time of Apple's 29W USB-C first-party adapter, and some other third-party options, like Griffin's BreakSafe USB-C cable. 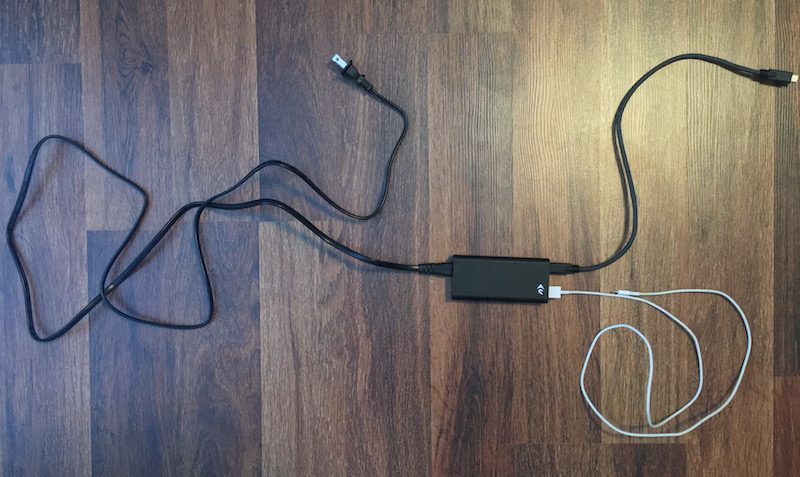 I only used the NuPower adapter within my house, but its bisected design could go against using it in a travel situation, where simpler options usually take precedent. Otherwise, daily use of the accessory is largely unobtrusive, as any decent cable should be. One big leg up NuPower has over Apple's adapter is consistency. 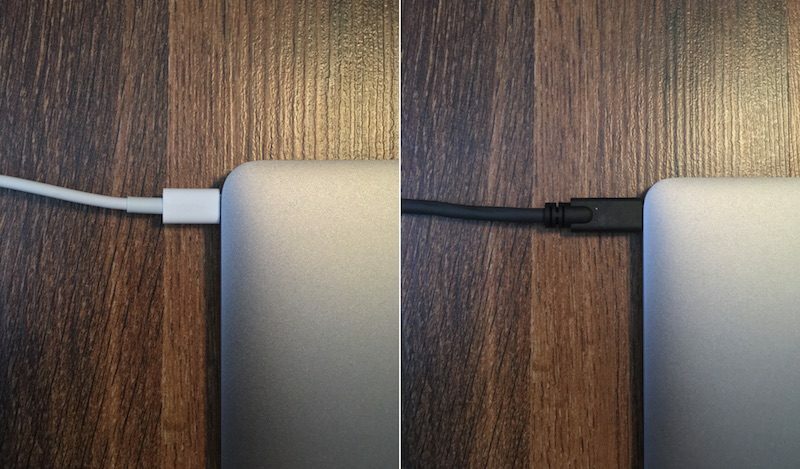 As many reviews on Apple's website confirm (myself included), its USB-C charge cable can have a mind of its own. In my own experience, the worst of this is hearing the cable lose and reconnect power to my MacBook, which subsequently dings in affirmation of a charge source. This is something that's woken me up in the middle of the night a few times, with no power outage or funky wall adapter excusing the occurrences. I've only had the NuPower adapter for a week, but in that time I haven't had any similar experiences. Even with the middle brick hanging off of an ottoman or desk, the cables remained plugged and in place. It's still recommended to have the power brick on a solid surface, however, so keep in mind the 18.5 inch USB-C cable and 4.2 inch long brick that will occupy space on your desk or whatever location you charge up the MacBook. Adding a second device will only add to the visible cable clutter near a MacBook, so anyone who likes to keep a clean desk might find qualms with the NuPower adapter, as well. For anyone happy with Apple's charging system (or who finds it less of a deal-breaker and more of a slight annoyance, like I did), the NuPower USB-C Power Adapter is a bit of a tough sell. The charging is identical, if potentially more reliable, and the addition of USB-A charging might be negligible to anyone with a smartphone or mobile battery pack, or even another nearby wall outlet. In my personal experience, when I'm charging my MacBook, I divert to my iPhone, and vice-versa, so the requirement of charging both at once isn't really a contingency I need to plan for. But if you're frustrated with Apple's own inconsistent USB-C charging cable and power adapter, NewerTech's $59.99 option is a valid substitute to charge up your Retina MacBook, especially if you find yourself charging an iPhone or iPad at the same time and have limited wall outlets available. The interconnected cable system may take some getting used to -- and those who prefer Apple's clean white cables will be disappointed by NuPower's bulky and bendy cords -- but otherwise NewerTech has made a device that's functional and reliable. The NuPower 60W USB-C Power Adapter will go on sale in early October on MacSales.com and Amazon for $59.99. Note: NewerTech provided the NuPower 60W USB-C Power Adapter to MacRumors free of charge for the purposes of this review. No other compensation was received. No USB hub included. Or at least USB-C passthrough. What a missed opportunity. Is it UL listed (or equivalent, such as Intertek)?